On February 2, 2010 my blog passed the 1,000,000 hits threshold. I am always impressed that people read my blog. I have posted over 700 times (this is #706) and there are a lot more to come. Here are some stats at the time of this posting. 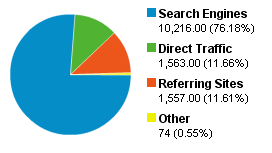 Akismet stats – 34,211 spams caught, 592 legitimate comments, and an overall accuracy rate of 99.885%. Thank you to all my readers. It is gratifying to me to see you embrace my efforts.